With its beautiful black and white coat and elegant spiraling horns, the Blackbuck Antelope is one of the most desirable exotics on the ranch. A mature Blackbuck male will typically weigh about 75-110 pounds with horns about 14-18 inches long and unique white rings around their eyes. Brought to the United States in the early 1900 from India and Pakistan, the Blackbuck Antelope is one of the fastest land animals in the world so be prepared for a challenging hunt. They posses excellent eyesight and will use this excellent speed to avoid all types of danger. As an added benefit, the meat of the Blackbuck is also very tender and flavorful. 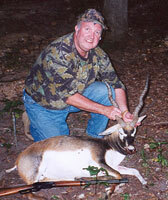 For more information on Blackbuck Antelope Hunting at High Adventure Ranch, please call (314) 209-9800 or fill out our contact form.